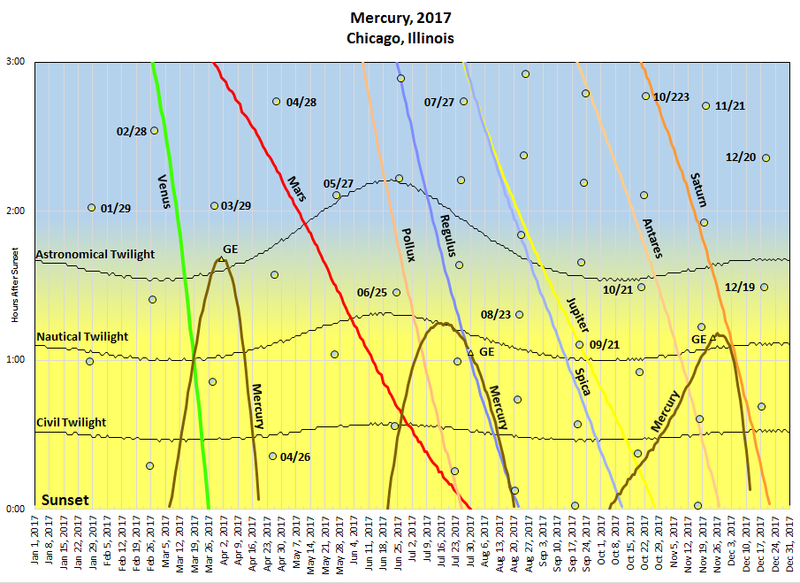 This chart shows the setting times of Mercury, other planets, and stars in the western sky compared to sun during 2017. The vertical axis shows hours after sunset. The horizontal axis shows the dates every seven days. Mercury makes three appearances in the evening sky during 2017. The brown curves on the chart above represent Mercury’s setting times compared to the times of sunset. The three appearances peak around their greatest elongation dates: April 1, July 29, and November 23. The greatest elongation is the planet’s greatest angular separation from the sun. As Mercury speeds around the sun it rapidly moves from the sun’s glare into the evening or morning sky and then back into the sun’s brilliance. The planet revolves around the sun every 88 days. Because our planet is revolving, yet at a slower speed and on a longer path, Mercury catches up and passes us every 116 days. Mercury never appears no more than about 27 degrees from the sun and never appears in the sky at midnight from the mid-northern latitudes. So it is in the sky mainly during the daytime and sometimes during twilight. 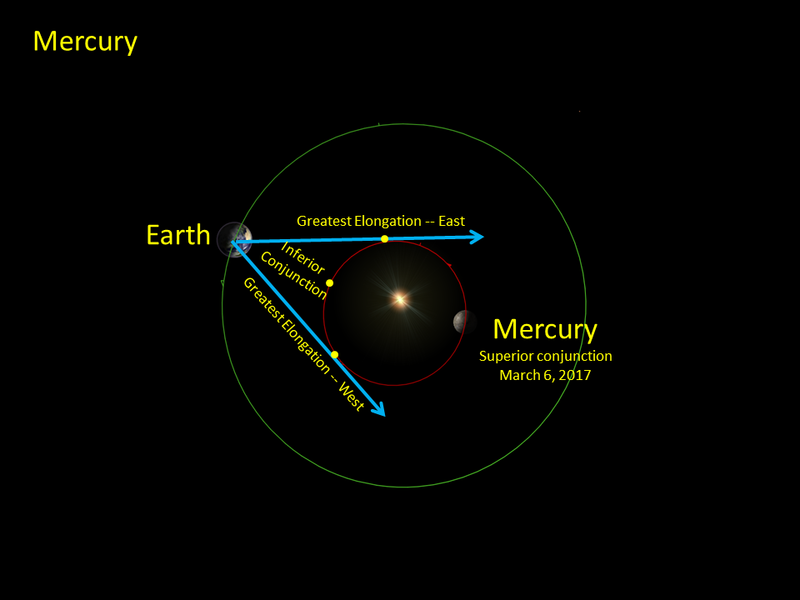 The chart above shows Mercury on April 1, 2017, when it is at its greatest elongation or maximum separation (19 degrees) from the sun. This chart shows the sun and Mercury at noon, if the sky were dark. 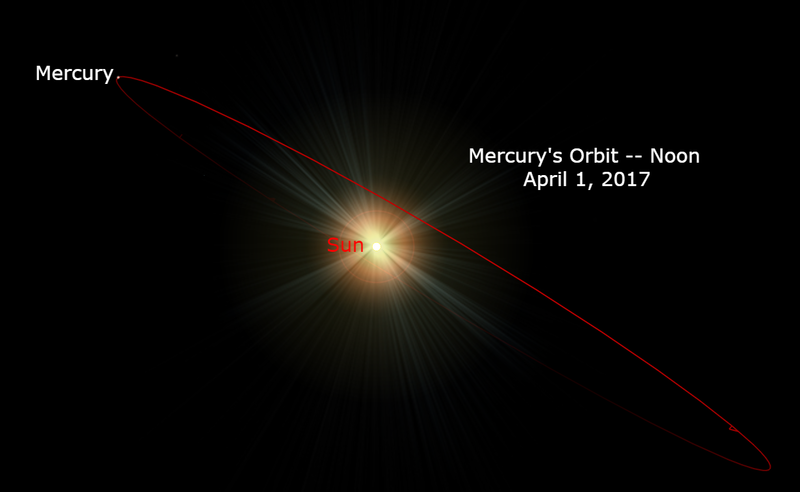 The red line represents Mercury’s invisible orbital path. Hold a ruler (12 inches) at arms length. If the sun were at one end, Mercury would appear near the other end when it is at its greatest separation from the sun. Mercury passes behind the sun on March 6, 2017. It is invisible because it is hidden in the sun’s glare. The planet then moves into the evening sky, east of the sun, until it reaches its greatest separation from the sun on April 1. It then rapidly moves into the sun’s glare and passes between Earth and sun (inferior conjunction). 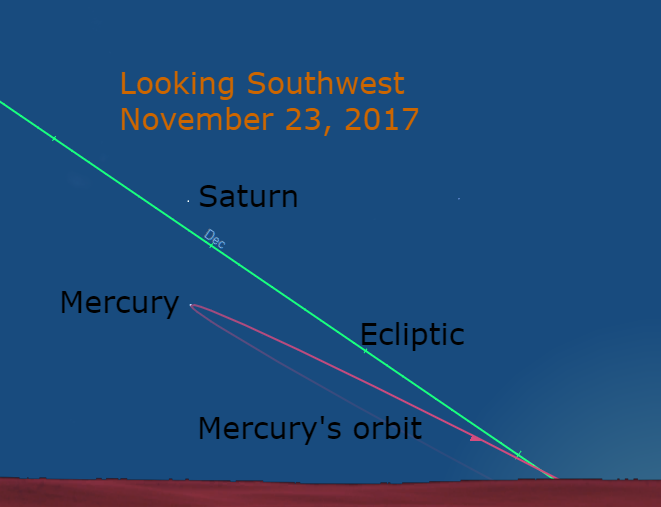 Mercury then moves into the morning sky, west of the sun. After reaching its greatest elongation it moves back into the sun’s brilliance reaching superior conjunction. The chart above shows the configurations if the earth were stationary. Our view of the planet is further complicated by our seasonal view of the plane of the solar system, known at the ecliptic. 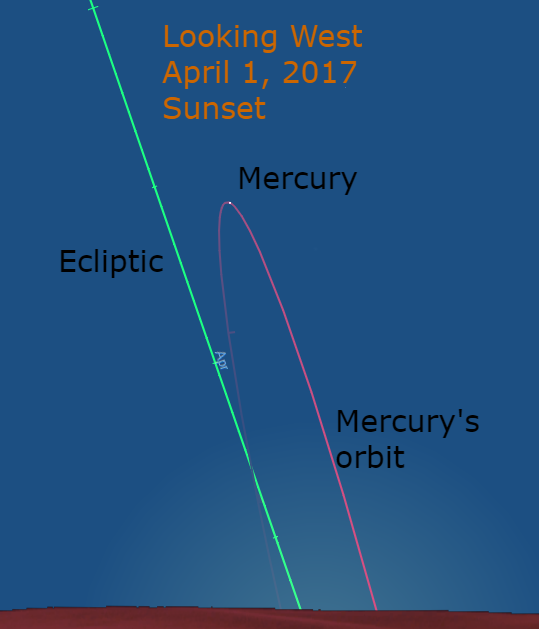 The chart above shows the plane and Mercury’s orbit at the planet’s greatest elongation (19 degrees), just after sunset. The narrow elongation would be particularly challenging to see, but the angle the ecliptic makes with the western horizon is very large. During spring evenings, the ecliptic makes its highest angle with the horizon. Venus and Mercury stand very high in the western sky during these times. In the morning, the ecliptic makes its sharpest angle on autumn mornings. On the evening of April 1, Mercury sets over 100 minutes after sunset. Astronomical twilight ends 96 minutes after sunset, and nautical twilight, 61 minutes. At astronomical twilight, see the chart at the top of this article, the sky is as dark as it will ever get naturally. At nautical twilight, the horizon is visible, so that mariners can take measurements of star’s heights (altitudes) above the horizon. So at this appearance, Mercury can be seen low in the western sky. First locate the planet with binoculars, then try with optical help. Look for Mercury a week before and after April 1. 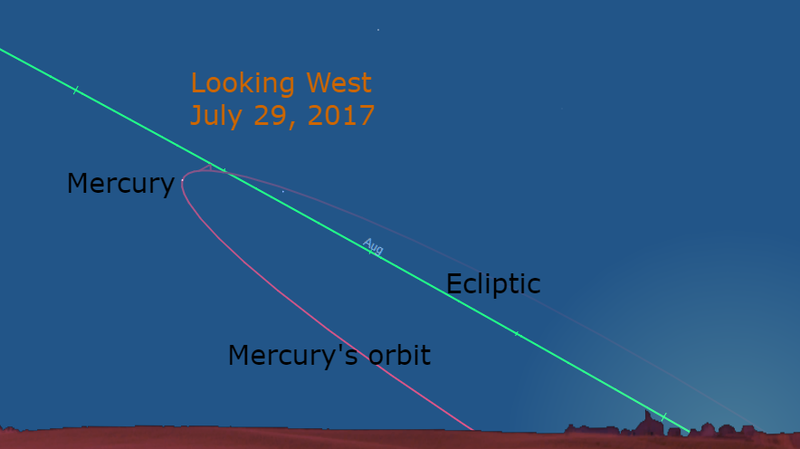 At the next greatest elongation on July 29, the angular separation is 27 degrees, but the angle of the ecliptic is very unfavorable. Mercury sets about 60 minutes after sunset, but nautical twilight occurs 70 minutes after sunset. Astronomical twilight occurs nearly 115 minutes (almost two hours) after sunset. Mercury is less than 15 degrees at sunset. This is likely a binocular or small telescope only apparition, from the unfavorable position of the ecliptic. Similarly, the November 23rd apparition has unfavorable observing conditions. At sunset, the planet is less than 10 degrees above the horizon and sets nearly 70 minutes after sunset. Saturn is 4 degrees above Mercury and sets nearly a 30 minutes after the speedy planet. Nautical twilight occurs at nearly the same time as Mercury sets and astronomical twilight is nearly 35 minutes later. Like the summer appearance, Mercury can be seen with optical aid. Mercury appears in the western evening sky three times during the year. Because of favorable seasonal circumstances, the April 1, 2017, view is the best of the year.